Posted on Mon, Mar 5, 2012 : 5:34 p.m.
Krystyna Bobowski, our next door neighbor, is a dear friend and marvelous cook. Prior to World War II, Krystyna was born and raised in Wloclawik, a town in northern Poland, and Bigos was a recipe her mother and grandmother often made. I've been trying to get her to pen some of her Polish recipes for years — here's the first one. "Everyone in Poland knows how to make bigos," Krystyna tells me. "And everyone has a different way of making it. This is how my mother taught me." During the war, Germany took over her hometown and she was forced to move to Warsaw. After the war, she returned to Wloclawek, married George Bobowsky, and they immigrated to Morristown, N.J. in 1963. George was a pharmaceutical chemist for Warner Lambert, and when they transferred the research division to Ann Arbor, George and Krystyna moved to the Midwest and were embraced by the Polish community and neighbors, such as myself and Richard. Krystyna lives with her daughter, Isabella, and we enjoy Ann Arbor's cultural amenities, such as ballet and the opera. We also relish cooking for one another, but I'm the lucky one in this arrangement; my dinners pale in comparison to her elaborate feasts, which could include clear broths and sorbets for cleansing the palate between courses. Krystyna's joie de vivre lights up our lives; Richard and I regard my exuberant neighbor with a combination of admiration, awe and anticipation of her next meal. 1. Place legs in large pot and add just enough water just to cover legs. Simmer over very low heat 3-4 hours or until turkey falls off bone. Remove turkey from water; strain and reserve cooking liquid. Chop turkey meat and reserve. 2. Meanwhile, drain liquid from sauerkraut and reserve. Place kraut in saucepan and cover in water. Simmer three minutes, drain and discard water. Repeat, simmering kraut in fresh water 3 minutes, then draining. Place washed kraut in a pan with reserved turkey stock and chopped turkey and simmer over low heat. 3. While onions are cooking, place prunes in a saucepan. Simmer in 1 cup of water until softened, 10-15 minutes, reserve cooking liquid. 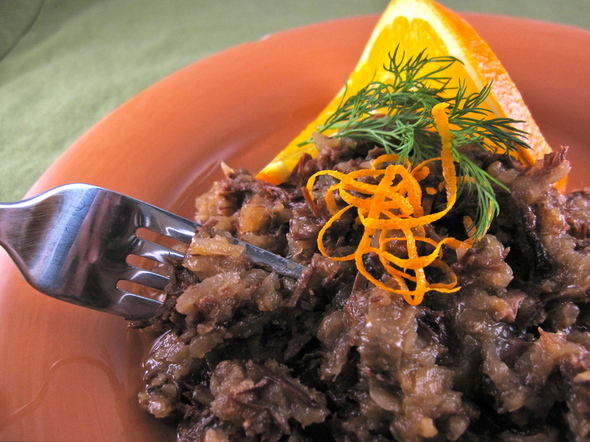 Chop softened prunes and add prunes and their cooking liquid to kraut mixture. Add re-hydrated mushrooms, if using, to kraut mixture, as well. 4. Cook together 1 hour, occasionally stirring. If more of a sour flavor is desired, add reserve sour kraut liquid to taste.